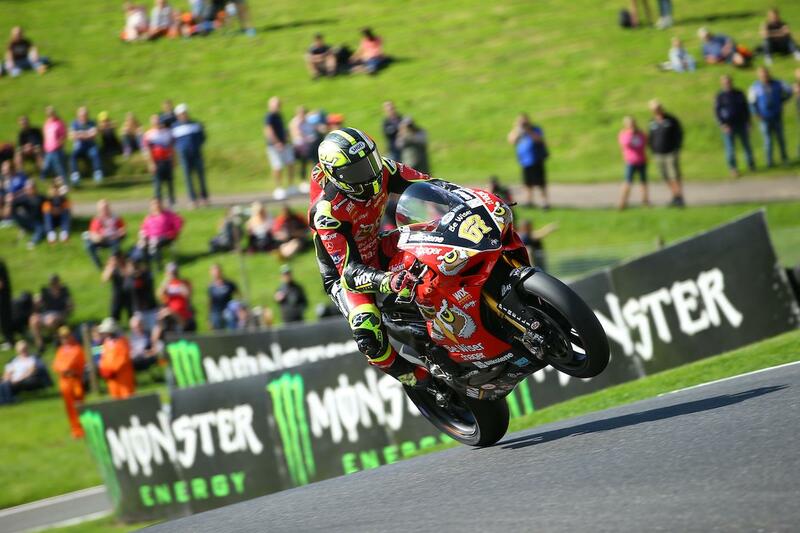 Shane Byrne led the way as the eighth round of the 2017 MCE British Superbike Championship got underway at Cadwell Park, but young gun Jake Dixon was chomping at the bit to lap just 0.030secs off his former mentor. Despite brief showers throughout the day, both Superbike practice sessions remained dry with sunshine beaming down on the iconic Lincolnshire circuit. After a disappointing Thruxton, Byrne came to Cadwell with a point to prove and looked set to top both of the day’s sessions. However, a small tip off at the bottom of the mountain put pay to fast lap in the opening free practice session. Nevertheless, the Be Wiser Ducati star bounced back to lap under the lap record in his final run with fresh rubber. RAF Kawasaki’s Jake Dixon was also under the lap record in second, with the leading duo almost 0.2 ahead of Smiths BMW’s Peter Hickman, who topped the opening session of the day. Christian Iddon got his weekend off to a strong start clocking the fourth fastest time for Tyco BMW, ahead of Josh Brookes who was able to salvage the fifth fastest time of the day after a difficult morning session. James Ellison showed an improvement on his Thruxton pace to complete the top six. Leon Haslam, who spent both sessions working on tyre life with the softer Pirelli rear, was seventh quickest ahead of the second McAMS Yamaha of Michel Laverty. John Hopkins and Jason O’Halloran completed the top ten.